Yes, childhood is so fleeting. I liked that last haiku. Lovely selection here, Jenn. I think I like the imagery of the last one the best. 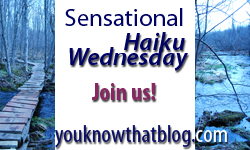 I found my ‘haiku head’ this morning so have posted mine this week. Jenn you have a beautiful collection of fleeting moments!! The first one treading on thin ice makes you smile!! Youth, beauty power and childhood are so fleeting and you have done it very effortlessly!! Again a tough prompt but I have succeeded I think. I “love” this prompt. (“Love” is in quotes because I’m being ever so slightly sarcastic!) All I have to do is look in the mirror every day and see how fleeting life is. Every day I live brings me one day closer to death. I’m happy to participate your meme this week. Thank you for the prompt. Have a wonderful week.